If you’re getting ready to graduate this spring, chances are you are hunting for your first real job. Okay, it may not be the absolute first job you’ve ever had, but for many of you it is likely your first full-time, career-type job. Assuming that’s the case you will also be in search of clothing that is appropriate to wear at your new career because we all know the sweatpants and boat shoes you rocked on the college campus will not be appropriate for even a business casual office. With that in mind, here are some tips about how you can build a basic, career-ready wardrobe for only $200! One of the first and easiest suggestions when you get started hunting down clothes for your new job is to stick primarily to neutrals and basics, at least to begin with. When I got my first job I made the mistake of buying a lot of shirts that were one-hit wonders and couldn’t be mixed or matched very well to create more outfit choices. The other problem with bold shirts is that they can’t be subtlely worn more than once in a week. This is a real problem if you only own 5-6 shirts and some are in the wash. Therefore when you get ready to start buying your work wardrobe, you should buy more basic button-ups, polos, or blouses and less bright, patterned shirts. Even colored blouses and button-ups can be more often and look different if they are solid instead of printed or patterned. 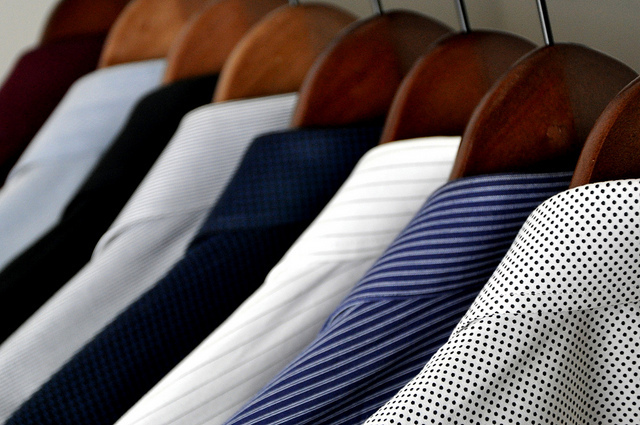 Most wardrobe guides suggest buying well-made, but expensive basic pieces for your work wardrobe. While I don’t disagree that an established employee should follow this advice, a new graduate who hasn’t started working yet shouldn’t spend over about $20-30 for a basic wardrobe piece unless it will be worn almost daily, like a suit if your office is that dressy. Instead I think you should stick to mid-quality and price for your staples. They will still last longer than items you bought at Walmart, but they won’t cost you an arm and a leg. Then once those wear out in a few years you can replace them with more expensive items as you’ll likely be making more money. I’ve been at my job and out of college for three years this May and one of the biggest mistakes I’ve made is buying too many clothes. I have nearly 30 bottoms, which includes slacks, capris, and skirts, and I easily have over 50 shirts that are work appropriate. With the amount of clothes I have, I should never have to repeat an outfit in a year (or more). It still might seem hard to build a work wardrobe of this size for only $200, but with other money saving tips, like shopping with coupons, hitting sales, etc. it can be done. I had a budget of $200 for my first work wardrobe and it was enough to get through at least one year at my first office job (I was still in school) without having to spend money on any additional clothing. Do you think you could build a work wardrobe on $200? If you’ve already built a work wardrobe before, do you have any other tips? What staples are in your work wardrobe? My advice is to make sure you know the company culture so that you fit your clothes. For interview, I am normally slightly dressier than the dress code of the company I am applying for. By the way, $200 would be enough for starters/newly grads. That’s a great idea Jayson! You definitely need to know the culture so you buy the right items. I waited until they had a sale at Men’s warehouse where you can get 2 suits for $300. They also were selling their ties and shirts for 50% off or more. I ended up getting 2 suits, a couple shirts and ties for $500. Those outfits were mostly all I needed for a few years. I agree that going out and spending a whole bunch of money is really a waste. Having a few bottoms with interchangeable tops I think is key and will save you money. I also found that buying clothes during off seasons can really save you lots of money in the long run also. Buying off-season is a good idea as long as it will still fit, be in style, and you’ll wear it when the season comes around again. When I had my day job, I wasted so much money on professional clothing when I should have tried harder to buy things that would last and styles that would stay. I hear you Michelle! I’ve wasted a lot of money that way too. But I’m trying to do better about it from now on. I am not sure I could build a work wardrobe with just $200, but I know I could get pretty close and I would do it by shopping at TJ Maxx. After I lost weight, I essentially built up my entire wardrobe from there for about $500. If I could go back in time I would try to build my wardrobe for $200. I purchased too much stuff for my first job after school. Today is the first day I have worn this burnt orange sweater I bought in 2011 and have 2 dresses I still need to wear. If I every change careers or lose weight, and have to build a new wardrobe, I will aim for $200. I know the feeling Sylvia! If I had to start over for some reason, I know I’d make better choices and stick to a smaller budget.